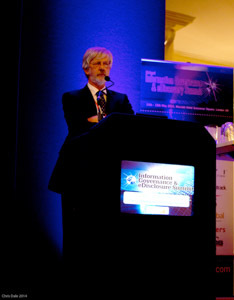 This year sees the 10th anniversary of the Information Governance and eDiscovery Summit, to be held at the Waldorf Hilton in London between 12 and 14 May. This event is, by a wide margin, the biggest event in the UK eDiscovery calendar. I have been going since 2007, first as a delegate and then as a participant – I seem to be involved as moderator of five different panels this year, which may make me seem not entirely objective in suggesting that this is the event to go to. I think you should, not just for the (extremely good) content but for the opportunity to meet others with the same problems as you and those offering solutions. Some of my photographs for the 2014 Summit can be found here together with short notes about some of the sessions. We are increasingly seeing overlaps between the technology, the processes and, not least, the people applied to all the subjects which fit under the IG umbrella, and that is reflected in many of the sessions. The other change over the years is that this event used to be dominated by Americans for the simple reason that there were very few people in the UK capable of marshalling and presenting the facts and suggestions. This had an unfortunate side-effect – the Americans would give us barely-adapted versions of the talks they would give in the US, telling us earnestly about legal hold, spoliation and Zubulake-style sanctions, none of which had much bearing on the day-to-day practice or the UK processes. This was a symptom of a wider issue. I remember an English judge declining an invitation to speak because these events “consisted only of US judges telling us about the Federal Rules of Civil Procedure”; he was oblivious to the possibility that he might redress the balance by coming to tell us about UK procedure. The other, wider, effect was that whenever I raised the subject of electronic disclosure (which was, after all, my job) I would meet the argument that it was something which Americans did very expensively – as if we had no electronic documents of our own. That led to my first visit to the US and to a growing ambition to seek to understand and to influence what happened there. Given my position on this, you may find it odd that I welcome the large number of US players who are taking part in this year’s event. Players like Craig Ball, Jason Baron and Ralph Losey, and a strong turn-out from UBS (who have what may be the world’s best in-house eDiscovery team), all have messages which travel. They are also by now attuned to the idea that the rest of the world is not a kind of backward US colony “two years behind the US” which is what one used to hear. The strong US contingent is matched by a strong UK team from law firms, corporations and providers of eDisclosure software and services. Sponsors include Consilio, Iris, Recommind, Relativity, Navigant, Huron Legal, NightOwl Discovery and UBIC, and there are many speakers from corporations and law firms describing how they are managing their data. You can download the packed agenda here. The first day consists of workshops including one on budgeting for information governance of the discovery run by Drew Macaulay of Consilio and one on understanding information governance and eDiscovery led by Alex Dunstan-Lee of Navigant. I am moderating a session on predictive coding / technology assisted review with Recommind, one called “Proportionality and finding what really matters” with Iris, the judicial panel with US Chief Magistrate Judge Elizabeth Laporte and New Zealand District Court Judge David Harvey, a session on costs with former Senior Costs Judge Peter Hurst and Andy Ellis of Practico, and one on industry standards and eDiscovery protocols with NightOwl. It is invidious to pick out any one session apart from my own, but if I was forced to do so I would urge you to go and listen to Craig Ball, whose keynote on Day 1 is called Girding for the E-Savvy Opponent. His focus is on the tactical advantage to be gained by a competent lawyer who understands how to demand electronic data in useful forms and how to search and review it. Craig has an approach which transcends jurisdictional differences and the fact that his background is the US Federal Rules of Civil Procedure is neither here nor there. In addition to the agenda items, there is a private screening of the film The Decade of Discovery, sponsored by Consilio. If you want to understand how US discovery has evolved to its present position, this is worth watching. I believe there are still delegate seats available. Registration is here. Come up and say hello if you see me there. This entry was posted in Consilio, Discovery, eDisclosure, eDiscovery, Electronic disclosure, Huron Legal, Iris Data Services, Navigant, NightOwl Discovery, Recommind, Relativity, Relativity, UBIC. Bookmark the permalink.